Before the contest starts, reset the Cabrillo file. This may not be necessary but if you participated in any of the WSJT-X RTTY Roundup tests or FT Roundup practice sessions, then you must reset the Cabrillo file in order to have a clean file for the contest. 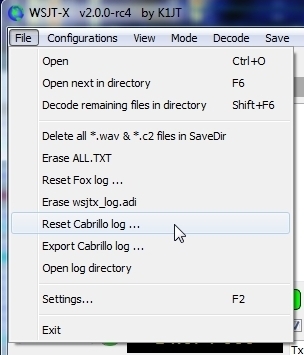 To reset the Cabrillo file, go the the File menu and select “Reset Cabrillo Log”. After the contest, you will Export the Cabrillo file. 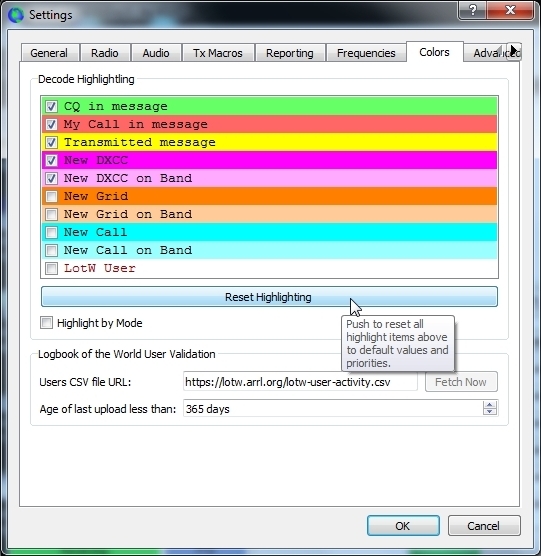 Additionally, in order to get color coding correct for dupes and new stations, you should clear the wsjtx_log.adi file. Before erasing wsjtx_log.adi, please think first about what you are about to do. The wsjtx_log.adi file is an important file. It’s an ADIF file that contains all QSOs made with WSJT-X. 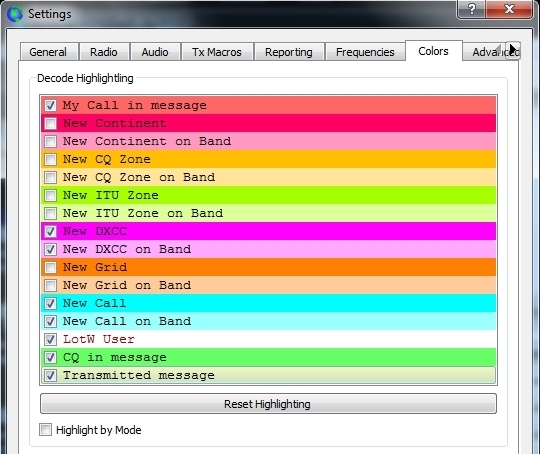 This file is read on WSJT-X start up and used to color-code decoded callsigns to show if they are new stations, new stations on a band, new grids, etc. Clearing this file means you are clearing all that important information. In most cases, the wsjtx_log.adi file can be replaced by exporting all your FT8 (or other WSJT-X mode) contacts from your general logging program, naming the file wsjtx_log.adi and copying into the WSJT-X log directory. 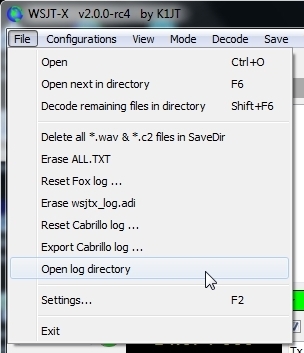 To browse to the WSJT-X log directory, you can choose “Open log directory” from the File menu. 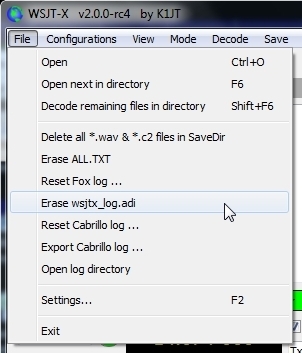 If you want to preserve your wsjtx_log.adi file, simply “Open log directory” from the File menu and rename wsjtx_adi.log to something like wsjtx_log.bak then restart WSJT-X. To clear wsjtx_log.adi, choose “Erase wsjtx_log.adi” from the File menu. IMPORTANT! Reset the color highlighting before starting the contest. This is so that stations already worked (dupes) show as green (or whatever color you wish to make it) and new stations show up in other colors. Go to the Settings > Colors tab screen and click “Reset Highlighting”. 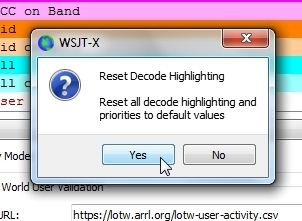 Confirm resetting decode highlighting by clicking Yes. The color screen will reset. Once it resets, enable or disable the options as shown below. The most important ones are “New Grid” and “New Grid on Band” since grids are not multipliers. Make sure those are unchecked. When finished with changes, click OK.